India is known for becoming a sweltering furnace in May, but last month was exceptionally brutal, with temperatures hovering 10 degrees Fahrenheit above normal for nearly two weeks. By June 4th, the heat wave had claimed over 2,500 lives, making it the fifth deadliest in recorded history. Roads melted in New Delhi as temperatures hit 113 degrees Fahrenheit and stayed there for days on end. Other parts of the country were nearly seven degrees hotter. Even in the mountain town of Mussoorie over 2,000 meters above sea level, residents felt the temperature climb to an unprecedented 97 degrees. It’s difficult to imagine this sort of heat without experiencing it firsthand, but the false color map shown above is one lens that Earth scientists can use to see how badly India cooked last month. The colors represent outgoing longwave radiation—the amount of heat pouring off the Earth and into space—as measured by the Clouds and Earth’s Radiant Energy System (CERES) sensor on NASA’s Terra satellite between May 15th and May 27th. Lighter colors indicate greater amounts of heat loss, corresponding with warmer surface temperatures. As we can see, the heat wave wasn’t limited to India, but rather, stretched across Pakistan and much of the Middle East. 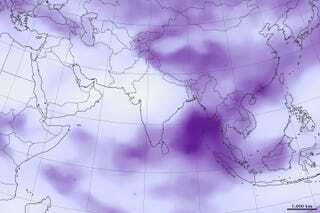 But for a number of reasons, India tends to suffer more than neighboring countries during these spates of hot weather. In part, this has to do with the high relative humidity that typically accompanies the heat. We rely on sweat to cool ourselves, but if the air itself is too wet, our bodies can’t evaporatively cool efficiently. The sudden onset of the recent heat wave probably contributed to the death toll, as well—heat acclimation is a gradual process that occurs over weeks of exposure to progressively higher temperatures. There’s also the fact that large swaths of the country are still very underdeveloped. A quarter of India’s 1.25 billion-strong population lacks electricity, and many Indians don’t have access to running water. Air conditioning is growing in India, but ironically, AC use is boosting the country’s climate-warming greenhouse gas emissions. And (surprise!) scientists expect these sorts of abnormal heat waves to become less and less unusual as our planet continues to warm. At least for the moment, the worst of the heat wave seems to have past. But as Indians cross their fingers and hope for strong monsoon rains this year, the future is looking hotter and hotter.